Succulents live in varying habitats across the world and can also be grown as houseplants. They use their fleshy parts as a water reservoir during droughts. But these same parts are also susceptible to diseases and disorders that discolor them with brown spots. Although succulent leaves are thick, fleshy and water-filled, this does not mean you need to water them more than other plants. The reverse is true. Succulents perform best when their soil dries between waterings. If they remain in wet or waterlogged soils, succulents suffer from edema, which causes brown, corky spots on the leaves. Sometimes the spots form on the undersides of leaves, making it more difficult to notice this disorder. The brown spots are particularly noticeable on the white areas of variegated succulents. Succulents are sensitive to too much fertilizer, and typically need infrequent or dilute fertilizer applications. If you give your succulent plants too much fertilizer, the salts that are contained in fertilizers accumulate in the soil and can burn the roots. As the salty soil solution moves upward in succulents, it may also burn the leaves and cause brown spots. Succulents are susceptible to a host of fungal leaf-spot diseases. These pathogenic fungi require water to reproduce sexually and to spread, so these diseases proliferate in moist areas and foggy climates. As a fungus takes hold of a plant, it may form brown spots on leaves that may eventually join to form large lesions. Once the disease is present, there’s no cure. 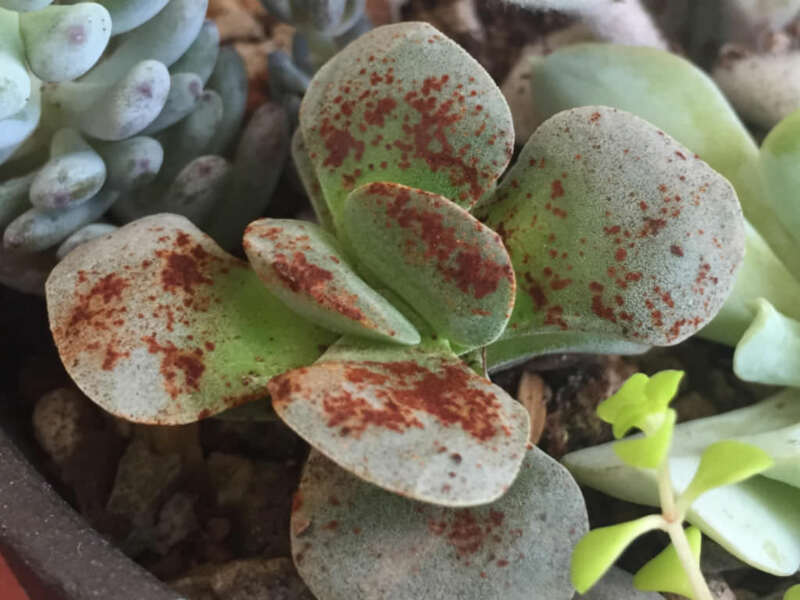 Preventing brown spots on succulent leaves is often as simple as choosing an appropriate planting or potting soil and watering the plants properly. A porous, well-draining soil is best. If you grow succulents in containers, use only pots that have drainage holes so water can drain away. Water plants thoroughly until the excess water runs out of the drainage holes, which helps flush excess salts.